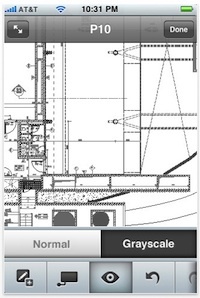 AutoCAD WS is the mobile companion application for AutoCAD. Version 1.0 for iPhone is shown here. Autodesk is releasing an update to AutoCAD WS, the free AutoCAD app designed for iOS devices like iPad and iPhone. AutoCAD WS is the mobile companion application for AutoCAD. Designed for Apple iOS devices, it allows users to share and edit AutoCAD files on their iPads, iPods, and iPhones through an online workspace accessible via both the mobile editions and the desktop versions of AutoCAD. The mobile edition is free for all users. Enhanced interface features designed to simplify editing and drawing and make marking up files more intuitive. According to Autodesk, the 1.1 release will be available "soon." AutoCAD WS is available free through Apple's App Store. It can be accessed directly via iTunes for iPad here and for iPhone/iPod here. Access to AutoCAD WS files via desktop software is made possible through a free, downloadable plugin, which can be found on the AutoCAD WS site here. Further information on the free edition of the full AutoCAD desktop software for education can be found on Autodesk's education site here.